Good ways to manage a changelog using git? I've been using Git for a while now, and I recently started using it to tag my releases so that I could more easily keep track of changes and be able to see which version each of our clients are running (unfortunately the code currently mandates that each client have their own copy of the PHP site; I'm changing this, but it's slow-going). In any case, we're starting to build some momentum, I thought it would be really good to be able to show people what has changed since the last release. Problem is, I haven't been maintaining a changelog because I don't have a good idea of how to go about it. For this particular time, I can run through the log and manually create one, but that will get tiring very quickly. I tried googling "git changelog" and "git manage changelog" but I didn't find anything that really talked about the workflow of code changes and how that coincides with the changelog. We're currently following Rein Henrichs' development workflow and I would love something that went along with that. Is there a standard approach that I am missing, or is this an area where everybody does their own thing? Thanks very much for your comments/answers! Piping that output to ChangeLog is what I currently use in all my projects, it's simply amazing. You might be able to augment this with a script of your own, which could do things like strip out the "Merged branch" bits, normalize formatting, etc. At some point you have to write it yourself though, of course. and commit that in your version release commit. If your problem is that those commit subjects aren't anything like what you'd want to put in a changelog, you pretty much have two options: keep doing everything manually (and try to keep up with it more regularly instead of playing catch-up at release time), or fix up your commit message style. One option, if the subjects aren't going to do it for you, would be to place lines like "change: added feature foobar" in the bodies of your commit messages, so that later you could do something like git log --pretty=%B | grep ^change: to grab only those super-important bits of the messages. I'm not entirely sure how much more than that git could really help you create your changelogs. Maybe I've misinterpreted what you mean by "manage"? DISCLAIMER: I'm the author of gitchangelog of which I'll be speaking in the following. TL;DR: You might want to check gitchangelog's own changelog or the ascii output that generated the previous. is your git history compatible ?. Merging, tagging, is not always so easily supported by most of the tools. It depends on how you manage your history. 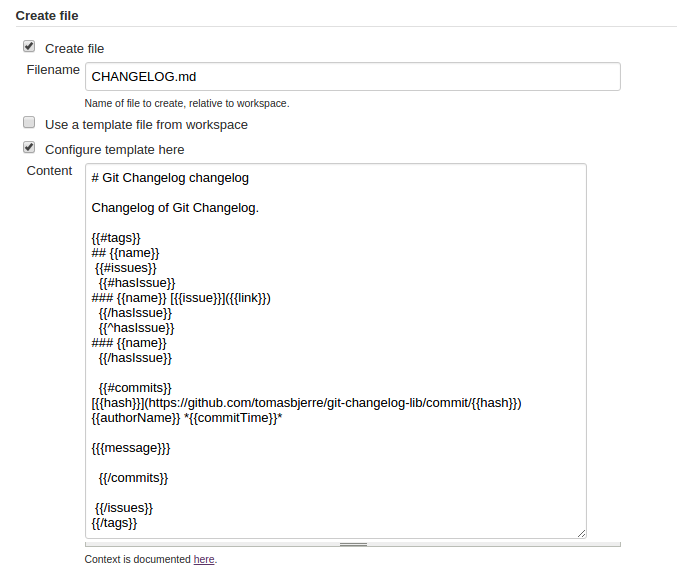 With all this in mind, I created and use gitchangelog. It's meant to leverage a git commit message convention to achieve all of the previous goals. Having a commit message convention is mandatory to create a nice changelog (with or without using gitchangelog). The following are suggestions to what might be useful to think about adding in your commit messages. as "refactor" if you don't really have any significative feature changes. Thus this should not also be part of the changelog displayed to final user for instance, but might be of some interest if you have a developer changelog. Try to write your commit message by targeting users (functionality) as often as you can. * 5a39f73 fix: encoding issues with non-ascii chars. * a60d77a new: pkg: added ``.travis.yml`` for automated tests. * 6b4b267 chg: dev: refactored out the formatting characters from GIT. Then, it's quite easy to make a complete changelog. You could make your own script quite quickly, or use gitchangelog. gitchangelog will generate a full changelog (with sectioning support as New, Fix...), and is reasonably configurable to your own committing conventions. It supports any type of output thanks to templating through Mustache, Mako templating, and has a default legacy engine written in raw python ; all current 3 engines have examples of how to use them and can output changelog's as the one displayed on the PyPI page of gitchangelog. I'm sure you know that there are plenty of other git log to changelog tools out there also. A more to the point CHANGELOG. Tell me if you people like it. The gitlog-to-changelog script comes in handy to generate a GNU-style ChangeLog. This rule is used at release time to update ChangeLog with the latest not-yet-recorded commit messages. The file .last-cl-gen contains the SHA1 identifier of the latest commit recorded in ChangeLog and is stored in the Git repository. ChangeLog is also recorded in the repository, so that it can be edited (e.g. to correct typos) without altering the commit messages. It generates changelog from tags closed issues,and merged pull-requests. This CHANGELOG.md was generated by this script. Be stored to file, like CHANGELOG.md. Is what I like to use. It gets all commits since the last tag. cut gets rid of the commit hash. If you use ticket numbers at the beginning of your commit messages, they are grouped with sort. Sorting also helps if you prefix certain commits with fix, typo, etc. Based on bithavoc, it lists the last tag until HEAD. But I hope to list the logs between 2 tags. List logs between 2 tags. For example, it will list logs from v1.0.0 to v1.0.1. printf "$(date "+%Y-%m-%d")  John Doe  <john.doe@gmail.com>\n\n"
Then I use the clipboard as a starting point to update the ChangeLog. It is not perfect (e.g. files should be relative to their ChangeLog path, so python/py-symtab.c without gdb/ since I will edit the gdb/ChangeLog), but is a good starting point. I have to agree with Tromey though: duplicating git commit data in the ChangeLog is useless. >git log --graph --all --date=relative --pretty=format:"%x09 %ad %d %s (%aN)"
Not the answer you're looking for? Browse other questions tagged git github changelog or ask your own question. Do I need to create a changelog file with Git?